At any given time, the player will have a number of cards he can affect (at the very least, cards at the bottom of the columns and whatever cards he has in the freecells) and a host of sub-goals to pursue in order to achieve one of the four major goals (filling each homecell), or the single ultimate goal (filling all homecells). A player may find himself focusing on a particular goal - digging out the red queen, for instance - which may draw his attention to a narrow area of the board. But at any time he can stop, take a wider view of the tableau and decide a new goal for himself. This is the critical point: The player sees goals and pursues them. He doesn't flail around and stumble into success. Moreover, pursuit of these many goals can be achieved immediately. That means both that there is no medium through which he must work (other than a very clean interface) and that there is little delay in doing what he wants. Achieving goals is as simple as moving cards, and moving cards is as simple as clicking the mouse. When the player knows what he wants to do, he simply does it; the game facilitates, rather than obstructs, the player's action. An added benefit of the game's immediacy and clear goals is the pacing in the player's control. When an area of the tableau is arranged in a favorable fashion, and the moves are obvious, the game can go very quickly. But when the player realizes he's running out of freecells and possibly cornering himself, the action slows down as he plays out the available strategies in his head. Many games last less than two minutes, but those with difficult patches (or "knots") can slow down considerably. All of this pacing, however, remains in the player's control. There are no artificial delays. The player is never waiting. FreeCell is an "action" game in the sense that the player is always active, either moving cards or studying the board to figure out the best move. Finally, FreeCell is fair. Some games are hard, some games are easy. But with a few rare exceptions, all of them can be won. And the key to winning them lies not in the random seed that generates the tableau but in the player's strategy. Moreover, every action has a predictable consequence. Loss is the player's responsibility, not the game's. In addition, FreeCell's rules are simple and few in number, meaning a player can understand why he loses when he loses. 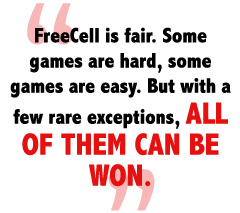 Making games that are fun as games is largely a matter of adhering to the same four qualities that make FreeCell so enjoyable. The presence of multiple clear and nested goals in adventure games, for example, makes the difference between good and bad design. The best adventure gameplay - found, for example, in Day of the Tentacle - presents the player with a number of obstacles and then lets him loose to find the tools to break through them. Often, getting those tools presents new puzzles, which then lead to even more puzzles, and so on. But no matter what, the player is always pursuing goals. The worst adventure games, by contrast, simply scatter tools and obstacles about, leading the player to act as a passive garbage man who vacuums and stumbles his way through the game. He has no goals other than the abstract purpose of reaching the end, but he knows from genre conventions that to win he needs to take anything not nailed down and use it somewhere else.